Join us this Saturday, January 19th as we kick off our first PEERvention Workshop of 2019. Last year, with our community’s support, we educated over 17,000 people through our HFTD Proactive Prevention education programming. This year we hope to educate 20,000 people. 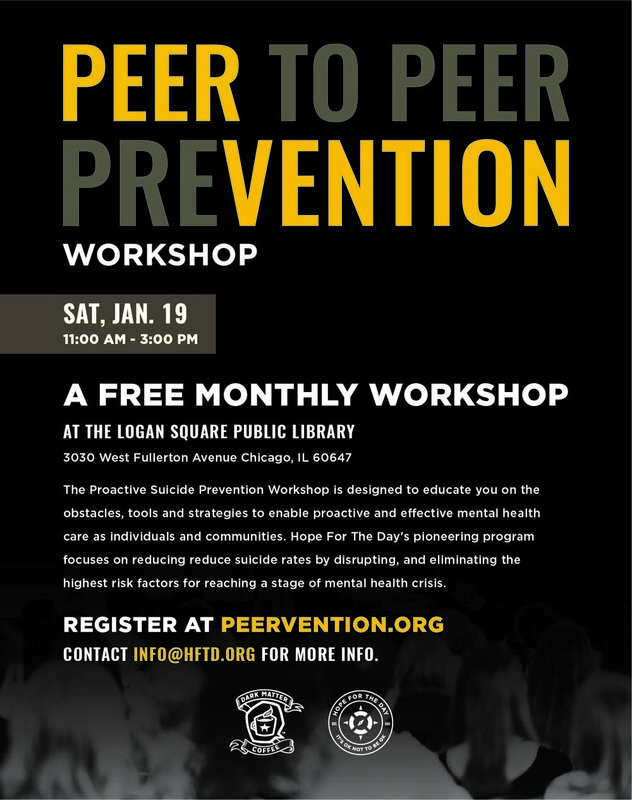 HFTD’s PEERvention Workshop is our flagship education program, held monthly at the Logan Square Public Library. It is an event free to the public, where anyone can attend and learn about the necessity for proactive mental health care. This hands-on education event provides an important resource to anyone who has been affected by mental health. In our discussion we aim to teach individuals how to confront their mental health, recognize the signs and symptoms of mental health challenges in themselves and others, and take action to eliminate the highest risk factors of suicide, like the silence of stigma and a lack of visible resources. By attending a PEERvention Workshop you can join us in equipping our community with the right tools to proactively prevent suicide. On average, over 121 people die by suicide per day in America alone, but it only takes one person to educate themselves and raise their voice to impact thousands. We implore individuals who have taken our workshop to go out into their own communities and start the conversation on mental health. Share your story to break the stigma and pass along mental health resources wherever there is a need. Together we can raise the visibility of resources and teach the world that IT’S OK NOT TO BE OK.
To RSVP to this month’s FREE PEERvention Workshop sponsored by Dark Matter Coffee click here.